In addition, all published Place Pages can be searched via the Place Page home page, or browsed as thumbnails. There is an official Knowledge Base article providing information on creating and using Place Pages, but I thought I’d offer a step-by-step guide to setting-up one or more Place Pages. Listing a calendar of events. Showing a region’s covenant – useful for residential rental regions). Buttons to allow visitors to the page to launch their viewer and teleport directly to the location (assuming they are Second Life users – if not, they’ll be taken to the SL sign-up page). In addition, a region’s Place Page can include a list of surfaced parcel Place Pages, and parcel Place Pages will include a link back to their “parent” region’s Place Page. For a parcel’s Place Page to be public, About Land > Show Place in Search for the parcel must be checked (incurring a weekly fee of L$30). Visit the Place Pages dashboard and log in using your Second Life credentials. Access your available place pages either by clicking your name in the top right corner of the page and selecting My Places, or by clicking on My Places just below the banner. Depending on your land holdings (e.g. the number of regions, the number of parcels on those regions), your list of available Place Pages might be short or long. Each Place Page item provides a summary and a default image. Note:the Is Viewable? column in the list determines whether or not a Place Page is viewable or not. True indicates the page is publicly viewable. Not Viewable indicates the Place Page cannot be publicly viewed, either because you as the owner have set it that way, or because it relates to a parcel which does not have Show Place in Search checked within its About Land floater. When you have located the Place Page you wish to edit, click Edit on the right of the listing to open the Page in default / edit view. This comprises a number of easy-to-understand sections, complete with explanatory text. Details: this section allows you to determine if the Place Page is publicly viewable, and define the information it displays. Disable This Place Page: prevents the page being publicly displayed. Show Covenant: displays the covenant associated with the land (if provided). Items for Sale: item must be set to Show in Search on the General tab of the object editor window, and will be listed with price, description and a teleport button. Note that items not for sale will also be listed, but will appear at the end of the list with Not Available in the price column. Show Calendar: displays a calendar of events for the region / parcel. Event must be created via the Events section of your Second Life dashboard at secondlife.com. Title: the title for the Place Page – shown overlaying the banner image. Tag line: 150-charcter tagline for the Place Page, shown overlaying the banner image. Description Editor: for entering formatted descriptive text to be displayed on the Place Page. Optional: this section provides you with the ability to set the page, font, and link colours used on the page. There is also a space to provide a YouTube URL. Note that at the time of writing the link colour only applies to the links in the Parcel Information section of your page; it does not apply to any links you may include in the description section of your page or any events listed with a calendar (if present). That can create visibility problems with these links, depending on the page background colour selected. Images: Section for uploading at banner / Hero image and additional images that are displayed in rotation on the finished page. Stats: general information on the region / parcel automatically displayed on the finished page as Parcel Information. At the foot of the page are buttons to Update the page with any changes you have made, or Cancel them. Note that clicking Update will refresh the page and display your changes. If you have more than one parcel in a region, you can automatically include all of your visible parcel Place Pages in the region’s Place Page. Note, again, parcels must have how Place in Search set within their About Land floater (incurring a weekly L$30 fee) in order for them to appear on their “parent” region’s Place Page. If you have multiple Place Pages, you can use the Bulk Enable/Disable option at the foot of the you list of My Places to enable or disable more than one Place Page at a time. Simply go to your My Places list, scroll to the bottom of the list and click Bulk Enable/Disable. Use the radio buttons in the Edit Status column to select the Place Pages you wish to enable or disable, then scroll to the bottom of the page and click Update. Or, if you wish to enable / disable all of your Place Pages, simply scroll to the bottom of the page and click on the required All button. Not that clicking any of these buttons will return you to your My Places listing. Place Pages can be viewed directly via their URL – which can be embedded into web pages, etc., via search the Place Pages main page or browsing the thumbnails. The Share It option visible to visitors to a Place Page allow visitors to share the Place Page on Twitter and / or Facebook. Name – a link to the region or parcel SLurl. Owner – a link to the group “owning” the land. Region – (parcel Place Pages only) a link to the “parent” region Place Page. For SL users logged-in to Place Pages, but not logged into Second Life, the buttons will launch the default viewer on their system. For SL users logged-in to Second Life, the buttons will launch the Places floater in the viewer, allowing a teleport to the location. For those who don’t have a Second Life account, the buttons will take them to the official SL sign-up page. At this point in time, due to updates made to the 360 snapshot project viewer, and as far as I’m aware, Place Pages do not currently support 360-degree images (the uploader sit requires the raw ZIP file from the viewer, which is no longer produced in the most recent project viewer updates). Place Pages are growing in capability – the addition of the calendar being (I believe) the most recent. However, how beneficial they are to users is questionable. Setting up a web presence to promote your Second life activities / offerings is easy enough through a range of “free” options (e.g. Weebly, WordPress). Place Pages are somewhat standalone with regards to other SL web properties. It would be useful if they were – just as an example – integrated with the Destination Guide so that those who have created a Place Page could link it to their Destination Guide submission, allowing it to be displayed when someone clicks on the View This Destination button in the Destination Guide. When it comes to browsing Place Pages, at this point in time it might be better if all “default” Place Pages remained “hidden” until they are expressly surfaced by their owner. Currently, there are over 17,000 listed Pages, and most of them are blank; this makes perusing the list tiresome. There are also some additional capabilities that might benefit Place Pages, such as – again, just as a single example – a way to see which places are currently popular when browsing the available pages, with places ranked by popularity. But all that said, for those not wishing to go to the lengths of creating a web page / website for their region / parcel, Place Pages offer a quick and easy means to develop a basic web page with a URL they can pass on to friends and through social media, etc., to help promote their Second Life presence. When Place pages first came out I went to the trouble to set them up for my New Orleans City. Then LL deleted all the work I’d done. I’ve not gotten up the will to do it all again. I know the feeling. I set up pages for Holly Kai Park … and lost them. Fortunately, the pages are pretty simple to re-establish; it’s just a case of crossing fingers and hoping nothing like that happens again. The feature set has moved forward somewhat since then, and the means to upload 360 snapshots as hero images using the current 360 snapshot viewer is – I’ve been told via the Web User Group meetings – on its way. I wonder if there are any numbers available that may or may not show the usefullness of Pages. Place Pages have never really been decently promoted by the the Lab – so it’s not unreasonable to say a lot of people are likely unaware of them. Following the initial release of Place Pages, when they were (briefly) promoted, there was a lot of curiosity / enthusiasm about them. Unfortunately, the Lab accidentally reset the database /lost all the data on existing pages. As per Amanda’s comment, this threw a large bucket of cold water over people’s desire to try / re-try them. As noted in the article, Place Pages are not very well integrated into our Second Life thinking; there’s nothing within the various web properties – Dashboard, Destination Guide, etc., that actually encourages those of us who can use them to even think about them. I partially covered (3.) in the article, suggesting how place Pages might be integrated with the Destination Guide. But there are other things that might be hope to bring Place Pages to the attention of those who might use them. Why not, for example have an “advert” on people’s dashboards at secondlife.com, similar in nature to the Premium membership ad: “Do you have a region or parcel open to the public to visit? 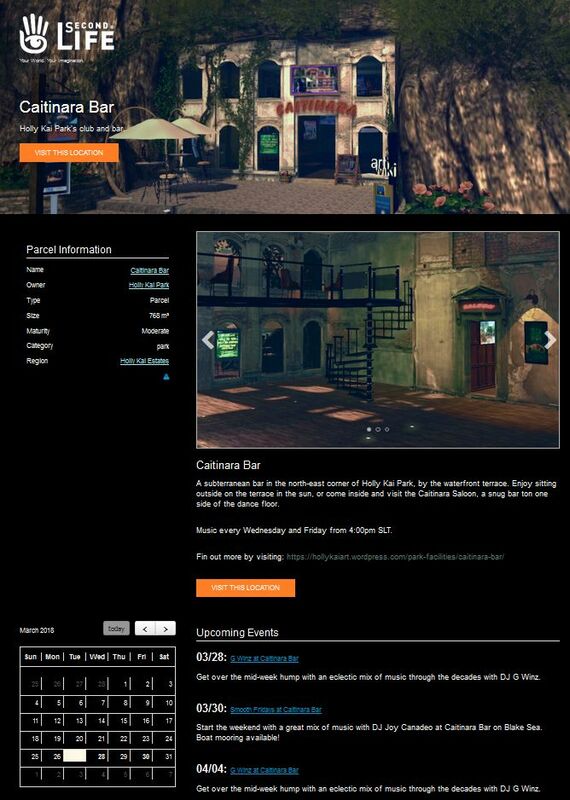 Why not promote it through our PLACE PAGES?” or “Need a web page for your role-play region? Why not get started with our PLACE PAGES?” – with a link to the Places home page. The value could then be further enhanced by offering a means for people to easily embed / integrate Place Pages into their own web sites. Pages are being indexed. It’s going to take a little time, however, as a result of the original pages all being deleted by the Lab. Also, the more they are used, the more they’ll get indexed.